Rickenbacker® Collection - The "B-series"
(Left to right) 4003SB, 360/12BWB, 320B © 1982 Rickenbacker International Corporation. Used by permission. All rights reserved. 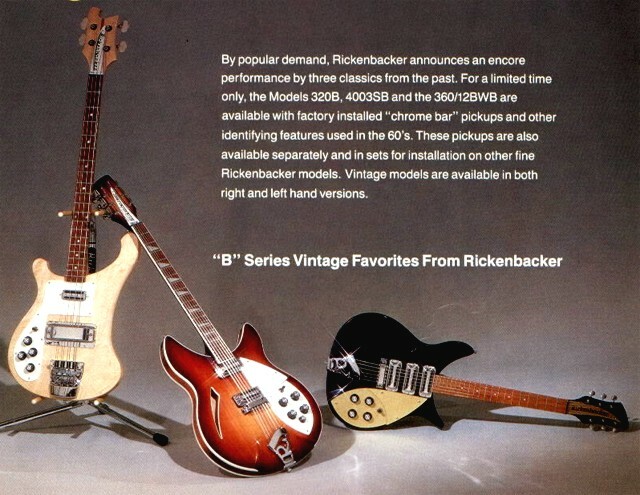 The B-series instruments were the first "reissues" from Rickenbacker. Not so detailed and faithful to the original models as today. Introduced in 1979. The instruments were modernized versions of the Rickenbacker guitars made famous by The Beatles. Later these instruments were released as very faithful reissues, the Model 4001V63, 360/12V64, 325V59 and 325V63. Dropped from production in 1982.